One of the best-known features of the Augustana College campus will look different for a while. 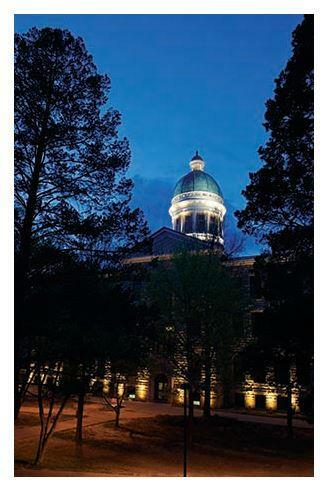 To mark the public phase of a major fund-raising campaign the dome on Old Main will be lit blue, and stay blue until the goal is reached, then turn to gold. The campaign is called "Augustana Now: A Campaign for Success in the World, for the World." And during the initial or "quiet phase," it's collected pledges totaling 75 million dollars. Now that the public phase has started, the final goal is 125 million. - and promote diversity, equity, and inclusion. Pledges from early donors have made possible an addition to the Hanson Hall of Science, the hiring of the college's first Vice President for Diversity, Equity, and Inclusion, and a new minor in data analytics. Augustana's last major campaign, in 2008, started with a goal of 100 million, and ended with 152 million dollars.